Posted on February 27, 2018 - By Fucosoft | Follow YouTube, Twitter to Get More Information. Along with the release of iOS 11, Apple is starting to roll out a new image file format – HEIC. It is a file extension of HEIF (High Efficiency Image Format), a lossy compressed media container format developed by MPEG (Moving Picture Experts Group). HEIF is based on the HEVC (High Efficiency Video Compression) or H.265 video format already used on newer iPhones. Its main advantage is that photos saved in HEIF are roughly half the size of JPEGs, and of better quality. Besides, a JPEG is a single image, but a HEIF may contain a single image or a collection of images, which makes HEIF perfect for Apple’s Live Photos. How to Convert HEIC/HEIF Files to JPG? Apple’s new HEIC image format is really awesome: high quality but occupy less storage. While it’s great improvement for iPhone users with limited storage, it could be troublesome to Windows users. At the moment, there are issues with opening HEIC files on Windows. How to fix it up? Don’t worry, here we’ll explain how to convert HEIC to JPG/JPEG for viewing on Windows PCs, Android phones, or old iOS devices. If you’re facing issues with HEIC format, a HEIC converter will help. 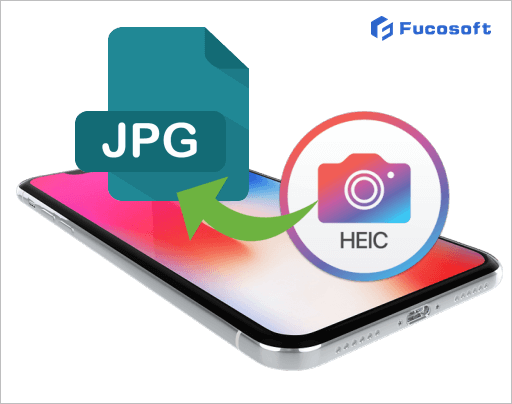 Fucosoft HEIC to JPG Converter is an easy-to-use yet powerful software that allows you to convert Apple’s new iOS 12/11 photos from HEIC to JPG/JPEG/PNG without losing image quality. It supports the complete iPhone range, including iPhone XS, iPhone XS Max, iPhone XR, iPhone X, 8/8 Plus, 7/7 Plus, 6s/6s Plus etc. running on iOS 12/11. 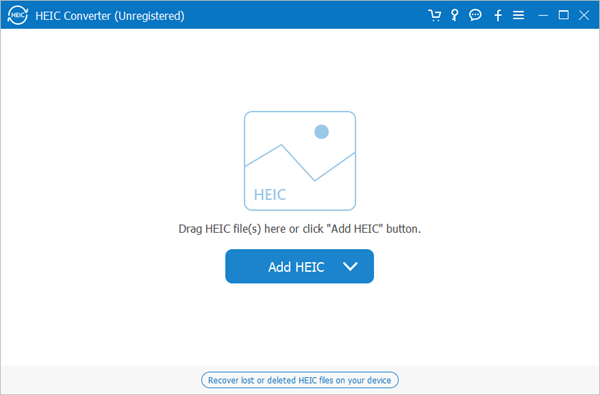 Download and install HEIC Converter. If you want to convert HEIC photos from iPhone directly, you need to connect the device to the computer. Click the “Add HEIC” button to add HEIC/HEIF files from computer or connected iDevice, or directly drag files to the program. Select the HEIC files you want to convert. Then choose the output format (JPG/JPEG or PNG) and set the output path. Finally click “Convert” to convert HEIC to JPG/JPEG or PNG. When completed, click “Open folder” to view your JPG or PNG photos. If you prefer not to install a software but need to perform a HEIC to JPG conversion, you can consider free online tools for help. There are many HEIC to JPG Converter online tools available, such as, Heictojpg.com, Apowersoft, Aconvert, Cloudconvert, Freetoolonline, etc. Here we take Heictojpg.com as example to show you how to convert HEIC to JPG online. Open your favorite web browser and go to Heictojpg.com. Cick the “+” button to import the HEIC files that you need to convert. The HEIC to JPG Converter online tool will then start to convert. After converting, download the JPG pictures from the website to your PC. If you don’t want to use third-party HEIC to JPG Converter tool, you can follow the tips given below to convert HEIC to JPG without any trouble. 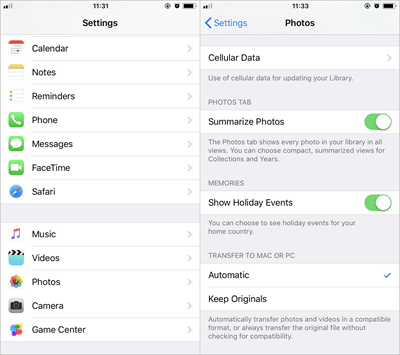 iOS 12/11 will save photos as HEIC formats as default, but you can turn on the Automatic Transfer of your photos. Your iPhone will automatically convert HEIC to JPG when transferring to computer. Simply go to Settings > Photos and select “Automatic” under Transfer to Mac or PC. You can easily take HEIF or JPEG photos as you wish with iDevice. 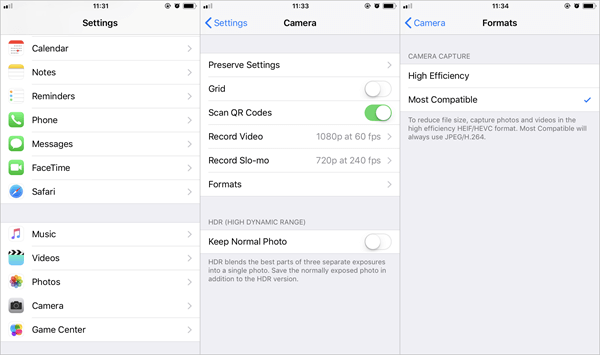 If you don’t want to save HEIC photos, you can manually turn off the High Efficiency photo format on your iPhone or iPad. Simply go to Settings > Camera > Formats and select the “Most Compatible” option. If you don’t want to convert HEIC files, you can upload them to a cloud storage service, such as Google Drive, DropBox, OneDrive, etc. Your HEIC photos will be converted to JPEG automatically. Then you can view the photos using your cloud service account in Windows. Now you know different ways to convert HEIC to JPG, then you can easily access your HEIC photos anywhere. If you accidentally deleted HEIC or JPG photos on your iPhone/iPad, don’t panic, you can use Fucosoft iPhone Data Recovery to easily retrieve them backup. It is a reliable tool to recover deleted photos and videos from iPhone or iPad.